There’s a new treat in town created especially for certified Cream-Oholics. The well-loved Cream-O goodness can now be enjoyed in a uniquely crispy and exciting chocolate indulgence, the Jack ‘n Jill Cream-O Brownie Crunch. This latest innovation from Universal Robina Corporation (URC) is a different take on the traditional chocolate brownies. Cream-Oholics can sink their teeth in rich and crunchy chocolate brownie crisps that come in two equally delectable variants - Peanut Thins and Choco Chips. For those who have a palate for the delicately sweet, there’s Cream-O Brownie Crunch Choco Chips, brownie crisps made exciting with chocolate chips. Cream-O Brownie Crunch Peanut Thins, alternatively, is perfect for those who want a nutty twist in their brownie crisps. 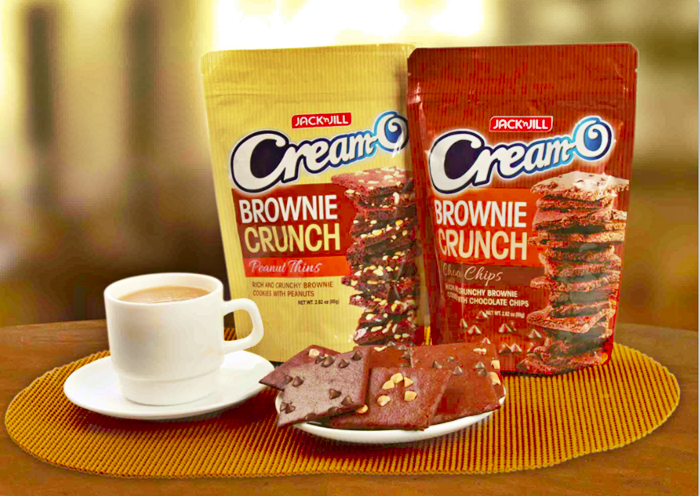 Cream-O Brownie Crunch comes in re-sealable packages, great for chocolate cravings on the go. Seize this sweet snacking experience that will keep you satisfied with chocolate goodness anywhere, at any time, now available in leading supermarkets and groceries nationwide. Cream-Oholics are in for a treat with Jack ‘n Jill Cream-O Brownie Crunch, the reinvention of the classic rich chocolate brownie packed to a crisp. It is available in re-sealable packages to satisfy one’s sweet cravings on the go.